ROCHESTER, Minn. (AP) — More than six months after being forced to absorb a 7 percent cut in public funding, Rochester area disability organizations are coping with crisis-level staffing shortages. Officials at Ability Building Center and Hiawatha Homes say the scarcity of workers has led to lengthening waiting lists, referrals put on hold, stressed-out employees and a workplace situation that in the long run is unsustainable. Residential homes have been hit particularly hard by the shortage, say residents and staff. Hiawatha Homes, a residential home network for people with disabilities, has openings for 80 positions right now, Crystal Landherr, Hiawatha’s director of development and communications, said to the Post-Bulletin. A staff of 400 employees is now down to 323 people. The shortage means that when shifts open up, it falls on existing staff to cover them. The waiting list at Hiawatha Homes has gotten so long that staff are no longer adding new names to it. It recently closed a home in Byron. Concerned about the possibility that things could get worse, Hiawatha Homes has developed fallback plans in the event they don’t have enough staff in their 21 residential homes. 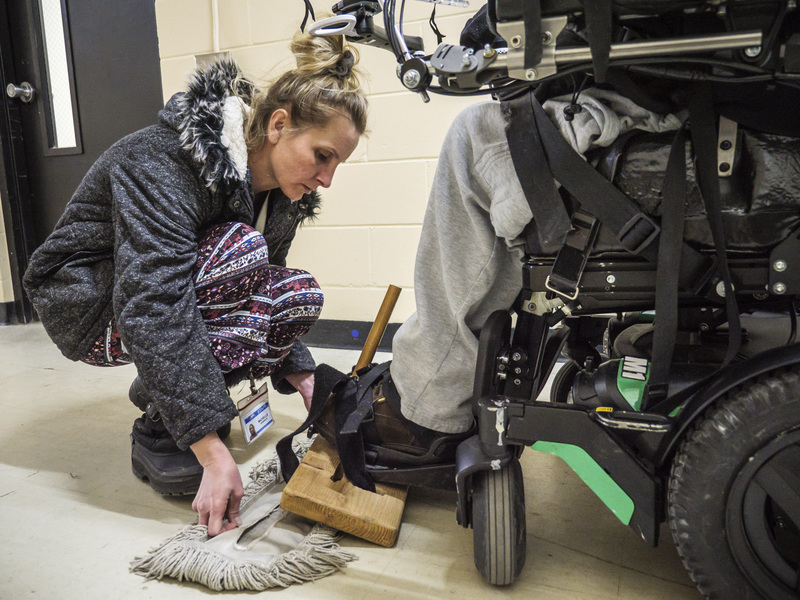 At Ability Building Center, an employment and rehabilitative service, program manager Kristen Lynne oversees a department so shrunken that she no longer has time to manage it. She instead spends much of her day filling holes in her work schedule and working with client’s one-one-one. Lynne said the cutbacks strike at the heart of ABC’s mission, which seeks to create jobs for people based on what they want to do, not just what they are capable of doing. It’s also about getting people with disabilities out and integrated into the community. John Cordero, a client at Ability Building Center, has found himself caught in the pinch of the staffing shortage. Born with cerebral palsy and quadriplegia, Cordero is an avid user of technology. He uses head movements to play Sony Playstation. His technology skill is such that he has trained people at Assisi Heights and 125 Live in how to use technology. Cordero would prefer to be working in IT, but the Ability Building Center doesn’t have the resources to arrange the intensive one-to-one support that would be required of such work. So he spends his days sweeping floors, which he candidly admits he doesn’t like. Cordero would also like to work four days a week rather than the two days he does. But, again, the staffing shortage doesn’t allow that. Lynne doesn’t say with 100 percent certainty that Cordero would get to work in his preferred occupation with increased funding, but his chances would be enhanced. Disability groups say they were already struggling with staffing shortages before they were hit by the 7 percent cut to rates paid through Minnesota’s Medicaid waiver program. The area’s low-single-digit unemployment rate means the pool of workers was already small. A direct care entry-level position at Ability Building Center pays $12 an hour, Lynn said, about the same amount paid to a worker at a convenience store or department store. Though the pay is entry-level, the work is not. The work requires training, capacity and an aptitude for the work, officials say. Personal care attendants help with the client’s feeding and personal cares. If the client uses a wheelchair, they help the client in getting in and out of it. They may also accompany the client to the job site. “It’s a skilled position that our society doesn’t value as much as it should,” Lynne said. An added pressure for residential homes is turnover. Once they train a new hire, the employee will often fly the coop to greener employment pastures, better pay and more regular hours. Michelle Wobbrock, an Ability Building Center one-to-one job coach, has worked in both settings. She has been Cordero’s care attendant since last June but before that she worked in a residential home. She doesn’t miss the hectic hours she worked at the residential home. Disability groups are hoping that the Legislature will come to the financial rescue. But the challenge is more complicated than dollars and cents, a legislator said. DFL Rep. Tina Liebling, chairwoman of the House Health and Human Services Finance Division committee that oversees the issue, said the challenge lies in finding an appropriate funding level that doesn’t cause costs to spiral out of control. The complication arises from the funding changes the state was required to adopt several years ago at the insistence of the federal government, which pays for half the services. The feds made the state set up a statewide method of determining rates for disability services, instead of relying on the county-by-county approach it once used. As a temporary measure, the feds allowed the state to create a banding mechanism to stabilize funding for disability groups. In that way, no organization would be forced out of business if it lost money under the new funding system. Nor would any group get a big windfall. But once the banding expires, which it is expected to do soon, the costs to the state are projected to soar by $30 million per year, Liebling said.